The date for our New Year pot-luck Luncheon: January 13 (Sun), 11:30 am – 3:00 pm New Year pot-luck Luncheon, Garden Room in Lakeside Garden Center, 666 Bellevue Ave, Oakland, CA. From now on, the July meeting will also be a weekend potluck luncheon. That will replace the regular evening meeting in July. As in 2018, we hope to have this luncheon in Marin County or other North Bay location. For the remaining four evening meetings (March, May, Sept, Nov), we are hoping to change the day to the 2nd Tuesday of the month (instead of the 2nd Thursday which it has been). We are checking now to see if our meeting room is available on that new schedule. We held our 37th annual exhibit on August 4-5, 2018 in the San Francisco Japantown. We had a good mix of well-known suiseki and also new ones, including several collected by newer members. The display was greatly enhanced with ikebana by Hideko Metaxas, and accent plants from her and other members. Please click the photo to view the photo gallery. We will also be exhibiting in Santa Rosa on August 25-26 at the 35th annual Redwood Empire Bonsai Society exhibit at the Veteran’s Memorial Building, 1351 Maple St., Santa Rosa, CA. Saturday 10:00 am – 5:00 pm; Sunday 10:00 am – 4:00 pm. This is the largest bonsai exhibit in the U.S., featuring more than 200 bonsai trees. You will also find a large club sale, lots of bonsai and suiseki vendors, and bonsai demonstrations on both days by Kathy Shaner. Go to http://www.rebsbonsai.org for more information. The 2018 Schedule has been updated. 1) The rains this spring have managed to coincide with both of our planned collecting dates, so we had to cancel both the Clear Creek and Cache Creek trips. We have rescheduled Clear Creek for April 28 – we are hoping for better weather! 2) We have changed the July meeting to be a weekend daytime activity in Marin County. It will be either a brown bag or a pot-luck luncheon and activities. We will update the schedule when we have details. Newcomers and visitors are most welcome at any meeting. Three Exhibits: In addition to our own annual exhibit at the beginning of August, the club will participate in the exhibits at the San Francisco Cherry Blossom Festival in April, and the Redwood Empire Bonsai Show at the end of August. More Collecting: The regular trips to the Eel River and to Black Butte Lake have been been scheduled this year as two-day trips for those who want to stay an additional day. The second day of the Eel River trip will be to Williams Creek. The second day of the Black Butte Lake trip will be to Thomes Creek. We have again scheduled trips to Clear Creek and Cache Creek – last year we had to cancel both because of rain, so we hope this year we will be able to go. Additional weekend daytime activity: We hope to replace the regular July meeting with a weekend meeting, potluck luncheon, and program held in Marin County. The schedule will be updated when the final July schedule is decided. We held our 36th annual exhibit on August 5-6, 2017 in Japantown in San Francisco. 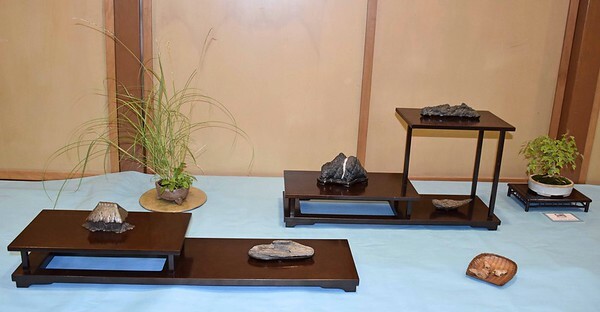 This year the show included some memorial stones from our first teacher, Mr. Keiseki Hirotsu, and also from long-time member, Mr. Hiroshi Suzuki. Please click the photo to view the photo gallery, or here for a slide-show. (Note: the slideshow requires that your device support Flash). Our current schedule for 2017 is now available (click on the tab above). Note that some dates are still to be determined and will be posted when known. We don’t know yet how long the winter rains will last and how high the rivers will be, and this effects when and where we can go collecting in the spring. We held our 35th annual exhibit on August 6-7, 2016 in Japantown in San Francisco. We had a lot of new stones on display this year, with a good variety of styles, including some from our newest members. One of the fun aspects to our exhibit is the opportunity to introduce suiseki to people who happen upon our show while attending the Nihonmachi Street Fair, which is also held on that same weekend of August.